War presidents" are hardly exceptional in modern American history. To a greater or lesser extent, every president since Wilson has been a War President. Each has committed our country to the pursuit of peace, yet involved us in a seemingly endless series of wars,conflicts that the American foreign policy establishment has generally made worse. The chief reason, argues Angelo Codevilla in Advice to War Presidents , is that America's leaders have habitually imagined the world as they wished it to be rather than as it is: They acted under the assumptions that war is not a normal tool of statecraft but a curable disease, and that all the world's peoples wish to live as Americans do. As a result, our leaders have committed America to the grandest of ends while constantly subverting their own goals. Employing many negative examples from the Bush II administration but also ranging widely over the last century, Advice to War Presidents offers a primer on the unchanging principles of foreign policy. Codevilla explains the essentials,focusing on realities such as diplomacy, alliances, war, economic statecraft, intelligence, and prestige, rather than on meaningless phrases like international community," peacekeeping" and collective security." 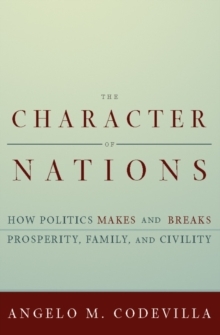 Not a realist, neoconservative, or a liberal internationalist, Codevilla follows an older tradition: that of historians like Thucydides, Herodotus, and Winston Churchill,writers who analyzed international affairs without imposing false categories. 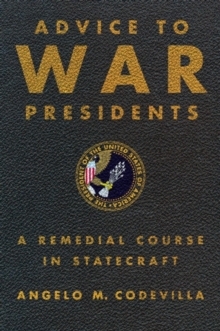 Advice to War Presidents is an effort to talk our future presidents down from their rhetorical highs and get them to practice statecraft rather than wishful thinking, lest they give us further violence.